When Individual Savings Accounts (ISAs) first appeared in 1999, as a replacement for PEPs and TESSAs, they were a relatively straightforward offering. In the 19 years since, complication has set in. The point has now been reached where the May 2018 report on savings tax from the Office of Tax Simplification (OTS) suggested that “there is scope for a wider full review of the current ISA landscape, to make the regime simpler and more accessible”. The government’s website says there are only four types of ISA – cash ISAs, stocks and shares ISAs, innovative finance ISAs, and Lifetime ISAs – but variants exist for specific investment needs. This guide will explain how five types work, in order of their original launch date. Despite their proliferation, all ISAs have a number of features in common. For example, they all enjoy tax privileges, a consequence of which is that the amount that you can invest in each type and in all ISAs are generally subject to annual limits. ISAs may only be run by HM Revenue & Customs (HMRC) approved ISA managers. Planning point – make the most of ISAs – they are all free of UK income tax and capital gains tax. Basic ISA: The original 1999 ISA lives on as a plan with two investment components: stocks and shares or cash. The two are now interchangeable, so you can transfer from a stocks and shares ISA to a cash ISA, or vice versa. 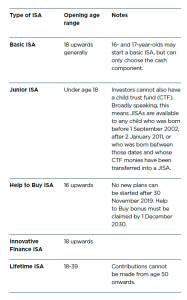 Junior ISA (JISA): The JISA is available to children under 18 who do not already have a child trust fund (CTF) Again, both cash and stocks and shares variants are available. Help to Buy ISA: In practice this is a variant of a cash component basic As the name suggests, this ISA is aimed at first-time buyers and its main benefits revolve around home purchase. The Help to Buy ISA was launched in December 2015, but it has since been overshadowed by the Lifetime ISA (see below). Help to Buy ISAs will be withdrawn from December 2019, although existing investors will be able to continue making contributions. Innovative Finance ISA: These relatively new ISAs are limited to investments in cash and two specialist, higher risk lending areas. Lifetime ISAs (LISA): The LISA, launched in April 2017, is aimed at encouraging saving for first home purchase or retirement by adults under the age of It provides investors with a government bonus, but comes with penalties if funds are withdrawn before age 60, other than for a first home purchase. To date few providers have chosen to offer LISAs. ISA investors must be resident in the UK, or a non-resident Crown employee working overseas and subject to UK tax on their earnings. Spouses and civil partners of eligible non- resident Crown employees can also contribute if they are themselves non-resident. An ISA can only be arranged on an individual basis (so cannot be held jointly) and it cannot be held in a trust. However, ISAs can effectively be inherited by a surviving spouse or civil partner (see ‘Inheritance’ below). Age eligibility for starting an ISA depends upon the type of plan, as show in the table on page 4. Planning point – there is nothing to report about ISAs on your tax return. Shares listed on any recognised stock exchange and certain other exchanges, such as AIM, can be held in the stocks and shares component of an ISA. Some, but not all AIM shares are eligible for inheritance tax business property relief after two years of ownership. All Financial Conduct Authority (FCA) authorised retail funds (i.e. virtually any unit trust, OEIC or UCITS) are eligible for ISA investment. Corporate bonds and EEA government securities are also eligible investments, regardless of the term to maturity. Cash can be held in the stocks and shares component without restriction. The stocks and shares component can also include life assurance, although this is now extremely rare. This may be invested in bank or building society deposits as well as money market unit trusts that hold deposits rather than securities. National Savings & Investments offers a single ISA product, the Direct ISA, to all investors. The Help to Buy ISA is only available with a cash component and, at the time of writing, only three building societies offered a cash component LISA. Peer-to-peer (P2P) loans – loans arranged to other people or businesses without an intermediary bank being involved. ‘Crowdfunding debentures’ – investing in a business by buying its debt. In both instances, the businesses involved are usually unlisted and small. Whereas the Financial Services Compensation Scheme protects up to £85,000 of deposits held in the cash component of basic ISAs, there is no such protection for peer-to-peer loans or crowdfunding debentures. The Financial Conduct Authority (FCA) has recently consulted on reforms to the innovative finance sector, including a proposal to restrict promotion of P2P loans to sophisticated or high-net-worth investors (as already generally applies to crowdfunding). A basic ISA with a stocks and shares component. A basic ISA with a cash component or a Help to Buy ISA (a small number of providers incorporate both types within the one ISA wrapper). If an ISA is transferred in full, the one-ISA-per-type-per-year rule still applies. Any subscription made at any time in the tax year during which the transfer is made is treated as a subscription to the recipient ISA. The maximum Help to Buy subscription is an initial £1,000, plus £200 a month. For instance, a plan started at the beginning of the tax year on 6 April 2018 has a maximum first year input of £2,400 (£1,000 + 12 x £200), whereas for one started on, say, 8 March 2019, the maximum first year input is £1,200 (£1,000 + £200). 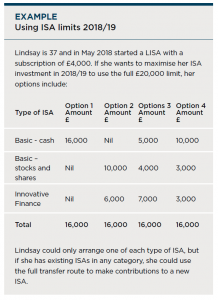 For LISAs the maximum subscription is £4,000 per tax year. For JISAs, the maximum contribution is £4,260 in 2018/19. In addition, a 16- or 17-year-old can subscribe £20,000 to a cash component basic ISA (including a Help to Buy ISA). The ISA transfer rules are complex and leave discretion for providers on whether to accept transfers in, although they are obliged to allow full transfers out. Funds transferred between ISAs or between the cash and stocks and shares components generally do not count as fresh subscriptions, but can complicate the calculation of subscription limits. Transfers may involve costs and/or penalties and may result in lost bonuses. Any transfer should only be undertaken after seeking expert advice. Some, but not all, ISA providers take full advantage of the legislation and allow you to withdraw and replace cash sums during the same tax year without the replacement counting as a fresh subscription. This flexibility is not available for LISAs or JISAs and is severely restricted in the case of Help to Buy ISAs. Graeme has a cash ISA worth £60,000, having invested the maximum £20,000 subscription in early May 2018. Eight months later he is in the process of moving home and needs £40,000 cash to complete his purchase. He has this amount in a fixed term deposit which matures in March 2019, but he does not want to pay an interest penalty to gain early access. Instead he could use the flexibility his ISA offers to withdraw the sum he needs in January 2019 and then replenish his ISA with the monies from his maturing deposit before 6 April 2019. Planning point – ISAs are effectively inheritable by a surviving husband/wife or civil partner. In 2014, ISA rules were amended to allow the value of any ISA to be inherited and used as an ‘additional permitted subscription’ (APS) by a surviving spouse or civil partner. Since April 2018, generally speaking, the ISA tax benefits remain during the administration period and all investments plus any subsequent growth or return form part of the APS. The ISA’s tax advantages are thus able to outlive the original ISA owner, with their ISA holdings and tax benefits normally being transferable in full to the survivor. This can have important estate planning benefits, effectively turning what is an individual investment into a joint investment. In some circumstances the inheritability of ISAs will mean that pension arrangements can be left untouched, which may prove useful for inheritance tax planning. All capital gains and dividends are free of UK tax. Foreign withholding taxes may apply, however. Dividends received within an ISA are ignored when considering your available dividend allowance (£2,000 in 2018/19 and 2019/20). Outside of an ISA the tax on dividends exceeding the dividend allowance now ranges from 7.5% for basic rate taxpayers to 38.1% for additional rate taxpayers. Interest received on bond and cash investments is tax free and does not count towards your personal savings allowance. If AIM and similar shares are held in an ISA, the normal inheritance tax (IHT) business relief rules apply. Broadly speaking, these mean that many AIM shares are IHT-free after they have been held for two years. All interest is tax free. Additional tax benefits apply to Help to Buy ISAs and LISAs. The extra tax benefits for the Help to Buy ISA only apply if the funds are used to finance a first-time buyer’s home purchase. The maximum value of the property to be bought is £250,000 (£450,000 in London). Purchases may be made on a joint basis, meaning that a couple could each use a Help to Buy ISA to buy the same property. Planning point – making a choice between ISAs and your pension is not a straightforward decision and needs expert advice. value of £1,600) and a maximum of £3,000 (for ISAs valued at £12,000 or more). No bonus payments will be made after 1 December 2030 or on transfer to a LISA (see above). At current interest rates building up a fund of £12,000 will take over four years if you make the maximum subscriptions throughout. If the Help to Buy ISA funds are not used for first time property purchase, there is no bonus payable, but the normal cash component tax-freedom for interest still applies. LISAs offer eligible investors a 25% tax-free government bonus on their subscriptions until they reach age 50. So, for example, if you subscribe the maximum of £4,000 in a tax year, the government will add an extra £1,000 to your LISA. The fact that a 25% figure applies to both the government bonus and encashment penalty can be confusing. As the OTS noted in its recent paper and the example below shows, “the 25% exit charge is not just the clawback of the 25% bonus, but includes also any returns on the bonus and an additional 6.25% charge on the contribution made by the saver”. Steve made a contribution of £3,000 to a LISA, to which the 25% government bonus of £750 was added. Over the following year the LISA grew in value to £4,000. If at that point Steve decided to withdraw £1,000 to spend on a new computer, he would receive only £750 after the 25% penalty is deducted. Planning point – The Help to Buy ISA will be withdrawn for new investors from 1 December 2019, but existing investors can continue to contribute. Your capital is at risk if you make peer-to-peer loans or invest in crowdfunding debentures. Any such lending is likely to be highly illiquid, meaning that you may not be able to access your monies until the loan is repaid, assuming there is no default. Levels and bases of, and reliefs from, taxation are subject to change and depend on your individual circumstances. Advise you whether ISAs make sense for you in terms of your particular needs and objectives. Advise which ISA variants are most suited to your circumstances. Review your existing ISA holdings to see if they still meet your aims and circumstances. Advise you on whether to bring child trust fund investments under the JISA umbrella and the opportunities this offers. Explain the relative advantages and disadvantages of LISAs and pensions. Set out the way in which ISAs can form part of your estate planning arrangements. Advise you on strategies to minimise the tax on your investments outside ISAs. Review your investments from time to time as agreed, to ensure that they continue to match your needs and circumstances. This publication is for general information only and is not intended to be advice to any specific person. You are recommended to seek competent professional advice before taking or refraining from taking any action on the basis of the contents of this publication. The Financial Conduct Authority (FCA) does not regulate tax advice, so it is outside the investment protection rules of the Financial Services and Markets Act and the Financial Services Compensation Scheme. This publication represents our understanding of law and HM Revenue & Customs practice as at 12 September 2018 and the proposals in the Autumn 2018 Budget.